I have had the ASUS X550ZA-WB11 notebook for a few days now, and couldn’t be happier with this thin laptop. The ASUS X550ZA is the new model of AMD A10-7400P powered laptop and has dedicated video card (mid-range). I purchased it because to me it was a very good deal, right now, its under 500. In this post, I want to write a few things that you might want to know, if you are now trying to find a new laptop. This ASUS X550ZA-WB11 is a 15.6 inch laptop but it is way thinner than I thought, and it does feel very nice to have in your hands. I knew this device has DVD drive, so when I purchased it, I thought it will look thicker but it is not. For a 11 inch range laptop, you can consider ASUS x205ta. It is a thin laptop, the LAN port has a sort of clip because the RJ-45 jack itself is thicker than the LAN port. From all of these unexpected thin interface, it has brushed aluminum look, so the nice look itself is just like a thousand bucks range laptops. To some people, appearance may be not important, but the nice look of a laptop is a plus for me. It has 1TB storage, and I am a bit disappointed on the HDD, because it is not a SSD. This is because I am used to a SSD computer, that I think all new computer should have a SSD these days, but of course it would raise the price at this circumstance. Might swap the HDD but not necessary for now. For under 500 bucks (price changes everyday) this ASUS X550ZA-WB11 laptop comes with the newer Quad-Core A10-7400P AMD processors with 10 cores CPU! – higher end compared with any laptops in this price range processors. It is clocked at 2.5 GHz but can be maxed up to 3.4 GHz if needed, acceptable performance. With Radeon R6 GPU, this baby is more than capable to do all my stuff this far, including gaming like LoL, BF 4, Minecraft, Farcry, Sims, WoW, and any other Mod games, in a quite responsive way. If you wish to have a gaming laptop, check out ASUS ROG GL551JW instead. This ASUS X550ZA comes with 8GB RAM, it has 2 slots with 4GB (at 1600Mhz) upgradeable to 16GB by replacing both sticks, but be aware that the warranty will be voided. Unless you work everyday with heavy resources jobs, like graphics, and video animations, the 8GB RAM is more than adequate for most computer programs. The 15.6 inch screen is at 1336×768 pixel HD resolution, and while it is not the best display or has best viewing angle out there, it’s decent to use everyday without any problems. Since it has 1x D-Sub VGA and a HDMI port this computer has the ability to handle multi-monitor, 2x USB 3.0 and a USB 2.0 ports are also included. While this does not come with a Blu-ray player, ASUS X550ZA-WB11 does have the DVD-RW multi drive that will work with DVDs or CDs, and will be able to write or read DVD-RW disks. This may not be the high-end gaming laptop, but at 500 bucks or less here, this has to be the best deal going. 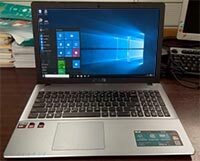 This ASUS X550ZA-WB11 has newest 2015 Quad-Core AMD 10 cores processors, 8GB of RAM and a huge 1TB hard drive, even has optical drive, highly recommended. Does this laptop have a memory card slot? The battery is not removable on this laptop. There are 10 screws to open. Make sure you put the screws in order when you open them, so you will have less problems to put the panel back on once you are done. After the screws are opened, I did invert my laptop in order to be able to access the ribbon, then you will need to put your fingernails or a thin credit card that you no longer use, right underneath your laptop, and pop the laptop from the panel out very carefully along the edges to open. There is a ribbon separating the keyboard plate and panel, you will need to detach that ribbon carefully. Some said, you can use small screwdriver without removing the ribbon, but I did remove the ribbon. The warranty will be voided if you do this, please use it on your own risk.